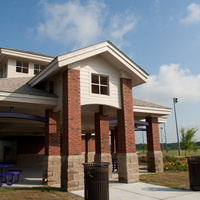 The North Recreational Complex located on Highway 264 East (10 minutes from main campus) features eight multipurpose activity fields. The fields can be sized to accommodate soccer, flag football, lacrosse, ultimate Frisbee, and rugby. Loved the sand art activity and the food options. I wish more clubs were there being represented though. Very well done. This annual event just keeps getting better and better. The weather was perfect too. Nice job by Student Affairs/Campus Wellness and Rec staff. The layout was great. Only regret was that I didn't get to the Wich Wich food line soon enough to use my ticket for food. It was gone before the end of the event. Perhaps adding a few more food stations in the future might be a good modification to supplement the one food line are a relieve concentration at peak moments. A good time was had by all!